We had to deal with a swift blow to the body two weeks prior to this trip. A combination of NAC Breda, RKC Waalwijk, safety liaison officers and the Dutch police held a meeting in which they concluded that we (32 members of EFW) were a security threat. Therefore they somewhat laughably decided to deny us tickets for the NAC v RKC match that we'd been planning on attending. So, thinking quickly, I decided to book up a coach and try and tackle the problem head on. Firstly, we'd travel to Essen in Germany and then onto Arnhem in the Netherlands for two games in one day in two different countries. Quite why I didn't do that in the first place, I'll never know. 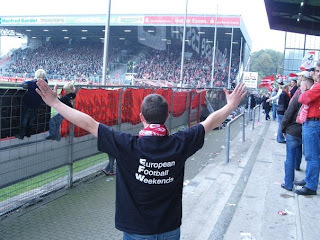 Especially as Rot-Weiss Essen appeared to tick every box going when it comes to the football FAN experience. Appropriately enough - as we left from Tilburg - our coach driver for the day was named King William. William in that that was his name and King in that he'd stocked the coach full of cold beer for the day. We'd not had much sleep from the previous nights shenanigans, so it was a fine effort that we only departed 10 minutes later than the advertised 10am - club fine for Andy Walker. The Belgian lads were the first to tuck into the onboard entertainment (beer) and the rest of the coach swiftly followed suit. King William was in for a bumper pay day. En route to Essen. We won't be pulling off just yet, 56k to go lads. I'd arranged to meet up with Roland Sauskat in Essen. 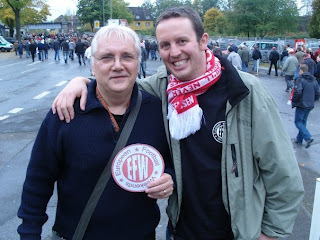 He works for the AWO FAN-Projekt and as soon as he boarded our coach became my instant hero for a number of reasons. BISH: he handed over a bag full of RWE memorabilia (thanks mate) and BOSH: as we pulled up at the ground we were met by around twelve van loads of riot police and.....erm Roland....pal...this wasn't in the script. As legends do, Roland took this all in his stride. Like Obi-Wan Kenobi he cast a Jedi spell on the police with a waving of his fingers "These are not the hooligans you are looking for, they can go about their business, move along...move along". And, with that, we were escorted through the police cordon at a rate of knots. Our coach went one way (to a safe parking spot) and we went the other (to the pub in the ground, above the club shop). And relax. Roland 'Obi-Wan Kenobi' Sauskat and I. Inside the FAN-bar. Our barmaid for the day. Despite being effectively a regional match in the German Fourth Division this had a big game feel to it. There is some history between the two teams. 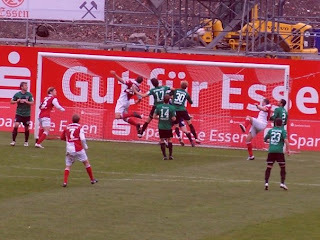 On the last matchday of the 2001/02 season, Essen played away in Münster. Some RWE supporters paid a visit to the local museum and somehow managed to waltz off with the city's famous sword. Just to rub it in they stuck it up for sale on a fan forum which alerted both the police and the press. Naughty but nice. Back in the pre-match pub the 32 of us mixed with the locals and enjoyed the rather splendid service (nod to the lady delivering us beer at regular intervals). 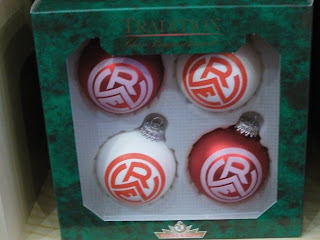 We heard about the RWE friendship with Werder Bremen and the rivalry with Sch*lke 04, Rot-Weiss Oberhausen and far too many others to mention. Sadly - upon entering the ground - the first thing I had to report was the fact that there had been a robbery. Someone had stolen one of the stands and (more alarmingly) one of the floodlights - the first ever floodies in Germany no less. Not to worry though, the three stands that remained were rocking. The party was in full swing helped by a tremendous away following from Münster. The crowd of 10,022 was comfortably the biggest of the season. Pleasingly, topping the 10k mark by virtue of 32 members of the EFW team present. Essen's current 'Roy of the Rovers' is Sascha Mölders. With seven goals in his last eight games he was the man and it was also he who was stoking up the atmosphere by winding up the vociferous home support. It has to be said he spent more time doing that than showing us his skills during a tepid first half performance. Cometh the hour though and cometh the Mölders as they (probably don't) say in these parts. Just after half time he notched the opening goal, sending the George Michael Stadium into raptures. That and a bout of spontaneous mooning to the fairly unhappy away contingent. Deep into injury time and with Big Deaks cajoled into helping the ultras with their large flag display - Essen were delivered a swift kick to the Polloks. Wojciech Pollok who'd not long been on as a sub, popped in a 93rd equaliser for Münster with the very last kick of the game - ouch! You'd have thought they'd won the World Cup Final itself they way they celebrated. We'd all have done the same though and no mistake. The George Michael Stadium (journalistic licence, tick - Ed). Münster to the left, Essen to the right, here I am stuck in the middle with you. ....that's Wissing, not missing you fool. Click to enlarge (very weak) gag. We returned to the EFW coach and thanked Roland and Essen for their splendid hospitality. Rot-Weiss Essen had ticked every box going: Huge banks of terracing (check), cheap as chips for a match ticket (8 Euros - check), no ban on beer (check), in fact - people walking around with jetpacks of beer in stadium (checkity-check), friendly welcome for EFW (check), brilliant atmosphere from both sets of fans (checkity-checkity-check-check-check). Full house. Excellent write-up. I spent nearly two years watching RWE when living in Essen. Some of the best football experiences of my life. You should definitely go back at some stage. Glad you enjoyed yourself shame my knee was buggered otherwise I would have been with you guys rocking the terraces. Thanks for your comments chaps - much appreciated. Without exception, everybody enjoyed the RWE experience. It´s a great pleasure for me that you and the other EFW´s had a good time at Essen. The report is tomorrow at our Fan-Forum and on our Homepage www.fanprojekt-essen.de . 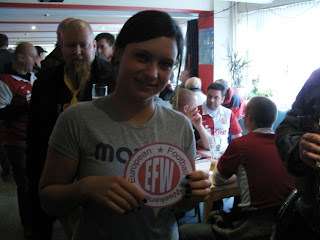 We have also a link to your page www.europeanfootballweekends.co.uk at our Page. Hope to see you again. I enjoyed reading this text, really nice. Just contact us via www.preussenstadion.de. I expected a bit of abuse from you lads as the report has a RWE bias. I didn't slag you off though (praised your support in fact) so I guess a bit of mutul respect is in order. I also enjoyed reading the comments on the www.westline.de/phorum A fan posted a link to the article on there.